Testing-instruments provider RaySafe launched the third generation of its radiation dose monitoring and safety platform, called RaySafe i3, at ECR 2017 last week. The i3 platform is an update to the company's RaySafe i2 offering, which was first launched five years ago. The i3 update offers more robust radiation dose metering technology for better measurements, according to the company. 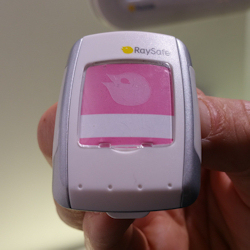 RaySafe's third-generation i3 real-time dosimeter. Image courtesy of RaySafe. Users of RaySafe i3 wear real-time dosimeters that deliver dose information wirelessly to a display, enabling users to view dose exposure to individual personnel in real-time with easy-to-read bar graphs. Green, yellow, and red bars indicate dose levels for each user, while accumulated dose is displayed next to the bars. More detailed information for each user can be accessed by tapping on the bars. Settings on i3's display can be changed and dose data viewed and exported for further analysis using the accompanying Dose Viewer software, while the company's Dose Manager application is available for more detailed analysis and for managing multiple dosimeters and displays throughout a hospital. In its booth at ECR 2017, RaySafe highlighted the usability of the platform, the ease with which the real-time dosimeters can be worn, and the minimal maintenance required. The i3 dosimeters also have a longer life cycle, from three to five years with the second generation to 10 years now. In addition, the dosimeters have a sensor that turns them off when not in use; this leads to more accurate dose measurements and can also alert administration to when sensors are not being worn. RaySafe i3 is suitable for fluoroscopy and interventional use, as well as with any open x-ray source. The platform will be available in the second quarter in both the U.S. and Europe. Testing-instruments provider Unfors RaySafe has signed an exclusive agreement to license its RaySafe S1 patient dose management system to Philips Healthcare. Unfors RaySafe announced that it is a supporting partner of the EuroSafe Imaging campaign, launched at ECR 2014 in Vienna. Fluke Biomedical has acquired testing-instruments provider Unfors RaySafe. Testing-instruments provider Unfors RaySafe will debut its new RaySafe S1 software for the first time in Europe at ECR 2013.